This page summarizes known problems in our data. Please carefully go over the page before you use our data for your science. There may be problems that went unnoticed and if you discover a new problems, please let us know. We will continue to improve the pipeline to mitigate these problems for future data releases. We often detect a large number of spurious sources in the outskirts of bright stars and galaxies because some pixels go above the detection threshold just by chance due to the noise fluctuation in the presence of an elevated background. In order to suppress these spurious detections, we subtract the very local 'sky' in the detection. However, this junk suppression procedure was mistakenly left disabled in the main processing. It was turned on in the afterburner processing and users are encouraged to use the afterburner table in the database to reduce spurious sources. About 7% of the objects have been flagged as junks. They are mostly faint noises, but photometry of parent objects may also be affected by the spurious sources as the afterburner only flags them and does not reperform photometry. Photometry of bright objects or objects with extended outskirts should thus be handled with caution (see also galaxy shredding below). Some of the patches are missing due to processing failures, which are in part caused by the disabled junk suppression. This resulted in holes in the survey footprint. To be specific, there are three missing patches in the Hectomap region in all the bands, and y-band in VVDS is missing nearly a whole tract (tract 9936). A list of the missing patches are available here. Large galaxies that have significant sub-structure are often overly deblended into many smaller objects. The fact that we did not enable junk suppression makes this even worse. This 'shredding' of objects results in poor photometry because a significant fraction of light is assigned to these child objects. The effect is more severe for late-type galaxies than for early-type galaxies due to spiral arms and knots therein. Comparisons with the SDSS photometry shows that, for bright ( i < 19 ) blue galaxies, about 15% of them suffer from shredding, half of which have their photometry underestimated by > 0.25 mag. Shredding is a larger problem for brighter sources with i < 18. In the future, we plan to use techniques similar to those used in the SDSS pipeline (Lupton et al. 2001) to identify such objects and remove the appropriate children objects from the blend. We are unable to model the PSF accurately for the visits with extremely good seeing. The problem severely affected the i-band in the VVDS field and has been mitigated by reprocessing the data with these visits removed as a temporary solution. However, there are about 20 affected patches in the z-band in VVDS (~ 0.035 square degrees, which is about 0.035 per cent of the Wide data in this release). The other fields are also affected (but less severely). These patches should not be used for science analysis as the photometry is poor. They can be easily identified with a large scatter and offset of the stellar sequence on color-color diagrams performed as part of the validation test in section 5.3.2. Refer to the FAQ page for how to identify patches with bad photometry. The sky around large objects (>~ 1 arcmin) are often oversubtracted (see the figure below). 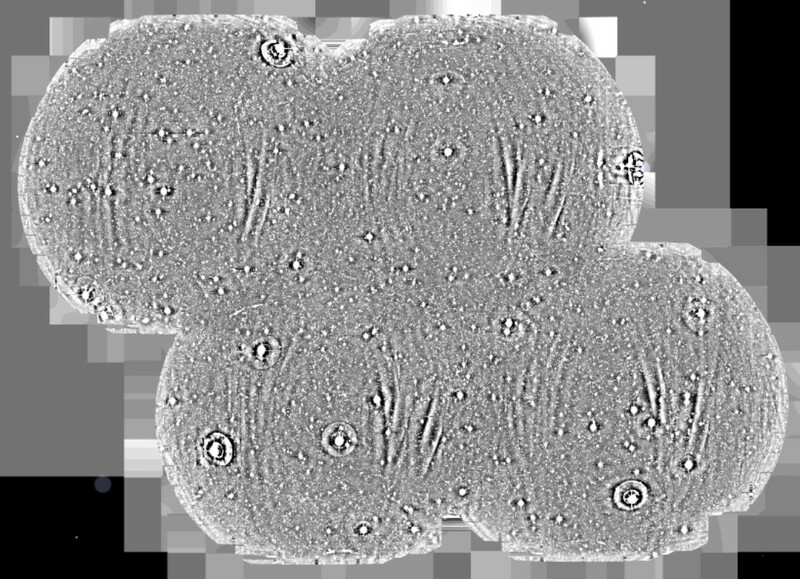 As described in the pipeline paper, we apply the background subtraction on a CCD by CCD basis using 128 pixel grids. The grid size is a trade off between how well we subtract the sky on small scales and how well we keep the large-scale light profile of objects unaffected. The current choice is tuned for the former, and the outskirts of large objects are often misinterpreted as part of the sky, resulting in the over-subtraction. A new algorithm to subtract the sky using the entire field of view has been developed and it will improve the sky subtraction in our future release. Remaining satellite trail (the slanted line on the left) and the over- subtracted sky background around the large galaxy at the center. Despite the galaxy shredding and over-subtraction of the sky, CModel tends to overestimate fluxes of large galaxies. Compared to the SDSS photometry, about 50% of bright (i < 19) blue galaxies have overestimated CModel fluxes by -0.1 to -0.7 mags. In rare cases (2% of all), magnitude differences can be -0.7 to -1.0 mag. On the other hand, only ~20% of the blue spiral galaxies with i < 19 have good CModel photometry (consistent with SDSS within 0.05 mag). Although CModel phootmetry of red galaxies appears less biased, we still observe a large scatter and obtain similar numbers to the blue galaxies (e.g., only ~20% have consistent photometry within 0.05 mag). Although the SDSS photometry may not be used as the truth table, the exact cause of this somewhat discrepant CModel photometry is being investigated. We detect and mask satellite trails by comparing the clipped and unclipped images when coadding, but a fraction of satellite trails still remain unmasked (see figure above). This is more severe in narrow-bands, in which individual exposure is longer and thus we have fewer visits. They often have nonsense colors with very high ellipticity, which can be used to reject them from a catalog. But, users searching for objects detected in a small number of filters (e.g., Lyman α emitters) should be careful and are advised to visually check the images. Difference imaging will be implemented as part of the processing in our future releases and that is expected to significantly reduce satellite trails as they can be detected as residuals in difference images. The frequency of the optical artifacts such as ghosts and scattered light depends on the density of bright stars, but for reference, about 1 ~ 2% of the area in UD-COSMOS is affected by the ghosts and scattered light. The ghosts and scattered light as well as the satellite trailes mentioned above are worse in UltraDeep and Deep than in Wide because of the small dithers. Objects that are located coherently on the sky over >~ 1 arcmin should be taken with caution and should be visually checked. The difference imaging mentioned above will reduce the ghosts in our future processing. Scattered light from nearby bright stars. Objects close to bright stars are flagged because they are likely to have bad photometry. We use a catalog of bright stars from Tycho-2 (Hog et al. 2000) and the bright object catalog from Naval Observatory Merged Astrometric Dataset (Zacharias et al. 2005) in the current version. Objects within a circular region around a bright star is flagged, but this bright star mask tends to be conservative and it may be overly so, e.g., a whole tract can be masked where there is a very bright star (mag < 5), although many objects far from the stars are actually unaffected. Another known feature is that nearby bright galaxies are often misinterpreted as stars in the NOMAD catalog. It is advised not to use the bright star masks for studies of nearby galaxies. Improvements will be made in a future version of the pipeline. The deblender tends to fail in very crowded areas such as the cores of galaxy clusters, resulting in poor photometry. This is a major problem for cluster science especially at high redshifts, where clusters appear more compact. PSF-matched aperture photometry is performed as part of the afterburner processing to mitigate the problem. A color-magnitude diagram of a z ~ 0.7 cluster shown below illustrates the improvement. The cluster red sequence has a large scatter in CModel, while it is tighter when the afterburner photometry is used. Users working on high density environments should check if their objects are affected by this problem and use the afterburner photometry where appropriate. r - z plotted against z for galaxies in the core of a z ~ 0.7 cluster. The left and right panels are for CModel and afterburner photometry, respectively. Note the tighter red sequence in the right panel. Flux uncertainties in the afterburner photometry are underestimated because significant covariances are introduced in the Gaussian smoothing process to match PSFs and they are not accounted for. The amount of underestimation depends on the difference between the target seeing and native seeing, but it can be as large as an order of magnitude. As a proxy, one could use flux uncertainties from the aperture photometry on the native PSF with the same aperture size. The CModel galaxy fitting algorithm utilizes a Bayesian prior on radius and ellipticity, largely as a way to regularize fits to low S/N and/or poorly-resolved galaxies. When combining this with the likelihood to form the posterior probability (which is then maximized by the fitter), the relative weighting of these terms is incorrect, giving the prior much greater influence over the result than intended. This is essentially equivalent to utilizing a prior that decreases much more rapidly at large radius or large ellipticity. As a result, CModel sizes and ellipticities are biased low, which almost certainly biases CModel fluxes low as well. However, because this biases affects all bands equally, CModel colors do not appear to be significantly affected. In fact, imposing such a strong penalty for large radii - even a physically unreasonable one - seems to decrease the number of catastrophic outliers in CModel colors. However, any galaxy photometry algorithm that operates on images with different PSFs in different bands can yield inconsistent colors if the model assumed for the galaxies is incorrect (as is always the case to some degree), and using the wrong prior can exacerbate this. We have not seen any evidence that incorrect prior weighting is degrading the colors significantly in this respect. The y-band suffers from scattered light and it was not removed very well in the sky subtraction, leaving arc/linear features (both positive and negative) in the coadds. The left figure shows the y-band image of the DEEP2-3 field. The level is strongly stretched to enhance the features. These features are most prominent in the Deep and UltraDeep fields, where we apply small dithers, but can also be seen in the Wide layer. Sources close to these features may have poor photometry due to the improper background subtraction. There is unfortunately no easy way to see how strongly the photometry is affected for each object. If the y-band photometry is crucial for your science, you are advised to visually check the images. We are investigating the exact source of the scattered light and working on improved removal of the feature. The COSMOS wide-depth stacks can be used for various tests, but we discovered that one of the visits used for the median seeing stack in the i-band had a guiding error and the visit was actually not included in the coadd. As a result, we have a shallower i-band data than the Wide depth by 0.16 mag (the integration is 15min as opposed to 20min). For many tests, a depth change at a level of 0.1-0.2 mag does not significantly matter, but if you are interested in objects at the detection limits, this may be a concern. The problem exists only the median seeing stack, and the other stacks are unaffected. When making coadds we ignore pixels with BAD or CR set. However, we missed to set any mask bit on the coadd to indicate that we have done this. We also do not set any mask bit on the coadd for regions that are at the boundary of CCDs. This problem makes our coadded PSF model inconsistent with images in these areas, since the coadded PSF model does not account for the fact that these pixels were excluded in the coadd. The same is true for pixels removed with safe clipping algorithms (see the data release paper), and the CLIPPED flag can be helpful to filter these pixels. We have already found some discrepancies between the coadd PSFs and the per-visit PSFs. Although influences due to this problem are still under discussion, we will keep this section updated of any reports.